SAAVEDRA, H. , RIBA, J.-R. , ROMERAL, L.
Electric motors used for traction purposes in electric vehicles (EVs) must meet several requirements, including high efficiency, high power density and fault-tolerance. Among them, permanent magnet synchronous motors (PMSMs) highlight. Especially, five-phase axial flux permanent magnet (AFPM) synchronous motors are particularly suitable for in-wheel applications with enhanced fault-tolerant capabilities. This paper is devoted to optimally design an AFPM for in-wheel applications. The main geometric, electric and mechanical parameters of the designed AFPM are calculated by applying an iterative method based on a set of analytical equations, which is assisted by means of a reduced number of three-dimensional finite element method (3D-FEM) simulations to limit the computational burden. To optimally design the AFPM, a constrained multi-objective optimization process based on a genetic algorithm is applied, in which two objective functions are considered, i.e. the power density and the efficiency. Several fault-tolerance constraints are settled during the optimization process to ensure enhanced fault-tolerance in the resulting motor design. The accuracy of the best solution attained is validated by means of 3D-FEM simulations. A. Pop, M. Radulescu, H. Balan,"Flux-density space-harmonics minimization for an axial-flux permanent-magnet machine," 4th International Symposium on Electrical and Electronics Engineering (ISEEE), 2013, 11-13 Oct. 2013, pp. 1-5. J. C. Urresty, J. R. Riba, L. Romeral, "Diagnosis of Inter-turn faults in PMSMs Operating under non-stationary conditions by applying order tracking filtering". IEEE Trans Pow Electron vol 28, pp. 507-515, 2013. J. R. Riba, A. Garcia, L. Romeral, "Demagnetization diagnosis in permanent magnet synchronous motors under non-stationary speed conditions". Electr Pow Syst Res vol 80, pp.1277-1285, 2010. J. Cusido, L. Romeral, J. A. Ortega, A. Garcia, J. R. Riba, "Wavelet and PDD as fault detection techniques". Electr Pow Syst Res vol 80, pp 915-924, 2010. M. T. Abolhassani, H. A. Toliyat, "Fault tolerant permanent magnet motor drives for electric vehicles," IEEE International Electric Machines and Drives Conference, 2009. IEMDC '09, Miami, Florida, 3- May 2009. L. Parsa, H. A. Toliyat, "Sensorless direct torque control of five-phase interior permanent-magnet motor drives," IEEE Trans. Ind. Appl., vol. 43, no. 4, July/Aug. 2007. G. Cvetkovski, P. Lefley, L. Petkovska, S. Ahmed, "Optimal Design of a novel single phase PM BLDC motor using genetic algorithm," 15th International Power Electronics and Motion Control Conference, EPE-PEMC 2012 ECCE Europe, Novi Sad, Serbia. L. Liberti, Se. Kucherenko, "Comparison of deterministic and stochastic approaches to global optimization", Intern. Trans. Operation. Research, vol 12, no.3, pp. 263-285, May 2005. M. Tabassum and K. Mathew, "A Genetic Algorithm Analysis towards Optimization solutions", Intern. Journal Digit. Info. Wireless Commun, vol.4 no-1, pp. 124-142, 2014. Q.-L. Deng, F. Xiao, W.-T. Huang, "Design of new-type axial flux permanent magnet in-wheel machine," IEEE International Conference on Electrical and Control Engineering 2010, pp. 5831-5834, 2010. M. Aydin, S. Huang and T. A. Lipo, "Axial flux permanent magnet disc machines: a review", In Conf. Record of SPEEDAM, pp. 61-71, May 2004. R. Benlamine, F. Dubas, S.-A. Randi, D. Lhotellier, C. Espanet, "Design by optimization of an axial-flux permanent-magnet synchronous motor using genetic algorithms," 2013 International Conference on Electrical Machines and Systems, Busan, Korea, pp. 13-17, Oct. 26-29, 2013. 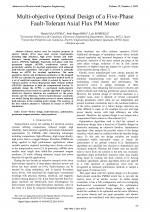 H. Saavedra, J.-R. Riba, L. Romeral, "Magnet shape influence on the performance of AFPMM with demagnetization," IEEE Industrial Electronics Society, IECON 2013, pp.973-977, 10-13 Nov. 2013. A. M. EL-Refaie, T. M. Jahns, "Optimal flux weakening in surface pm machines using concentrated windings," 39th IEEE IAS Annual Meeting Industry Applications Conference, 2004. Conference Record of the 2004. pp. 1038-1047, vol.2, 3-7 Oct. 2004. D. C. Hanselman, Brushless Permanent-Magnet Motor Design,McGraw-Hill Inc. New York, pp. 151-153, 1994. J. F. Gieras, R.-J. Wang, M. J. Kamper, Axial flux permanent magnet brushless machines, Kluwer Academic Publishers, pp. 38-40, New York, 2004. 112-2004-IEEE Standard Test Procedure for Polyphase Induction Motors and Generators, 2004. S. Huang, J. Luo, F. Leonardi, T, A. Lipo, "A Comparison of power density for axial flux machines based on general purpose sizing equations", IEEE Transactions on Energy Conversion, vol. 14, no 2, pp. 185-192, June 1999. A. M. El-Refaie, "Fault-tolerant permanent magnet machines: a review," IET Electr. Power Appl., vol. 5, no. 1, pp. 59-74, 2011. J. A. Haylock, B. C. Mecrow, A. G. Jack, D. J. Atkinson, "Operation of fault tolerant machines with winding failures," IEEE Trans. Energy Convers., vol. 14, no. 4, pp. 1490-1495, 1999. P. Zheng , Y. Sui , J. Zhao , C Tong , T. A. Lipo, and A. Wang, "Investigation of a Novel Five-Phase Modular Permanent-Magnet In-Wheel Motor," IEEE Trans. Magn., vol. 47, no. 10, pp. 4084-4087, Oct. 2011. G. V. Cvetkovski, L. B. Petkovska, "Weight Reduction of Permanent Magnet Disc Motor For Electric Vehicle Using Genetic Algorithm Optimal Design Procedure", IEEE International Conference EUROCON 2009, pp. 881-888, 18-23 May 2009, St. Petesburg. Y. Duan, D. M. Ionel, "A Review of recent developments in electrical machine design optimization methods with a permanent-magnet synchronous motor benchmark study", IEEE Trans. Ind. Appli., vol. 49, no. 3, pp. 1268-1275, May/June 2013. S Shamlou, M Mirsalim, "Design, optimisation, analysis and experimental verification of a new line-start permanent magnet synchronous shaded-pole motor", IET Electric Power Applications, vol. 7, no. 1,pp. 16-26, 2013. K. Hong-seok, Y. Yong-Min, K. Byung-il, "Rotor shape optimization of interior permanent magnet BLDC motor according to magnetization direction", IEEE Trans. Magnet, vol.. 49, no 5, pp. 219-2196, 2013. Citations for references updated on 2019-04-20 16:00 in 169 seconds.